As you likely know, a five-story office building with ground-floor retail will eventually rise on this northeast corner. Goodbye without regrets. So much of the commentary on this site is about "neighborhood." The Continental hasn't been, and perhaps never was, about being a neighborhood bar (pace all those who remember live shows there). There were no bartenders there that one went in to see (like John and Maria at Grassroots or Brendan at Bull McCabe's). No regrets--some places should fade away and this is one of them. @10:00am: Agreed! This, to me, was only a bro-magnet bar, not anything to do with the neighborhood (except its location made it "cool"). I'm only sorry it's being replaced by a crappy glass building; one lousy thing yields to another lousy thing. There's no win for the neighborhood anywhere in this. Anyone remember "Wrong Way Shaun"? Rocker dude who used to play at Continental and also did furniture deliveries in his van from antiques market at Broadway/Grand. Nice guy ! It was an important neighborhood live music staple, and that is what we remember and miss. If you don't get it, maybe it's time to go back to Ohio. I went last night to try to attend the party and was turned away-- they said "tonight is a private party and the actual last night is the 31st." Not sure if that was true or B's, evgrieve should investigate! 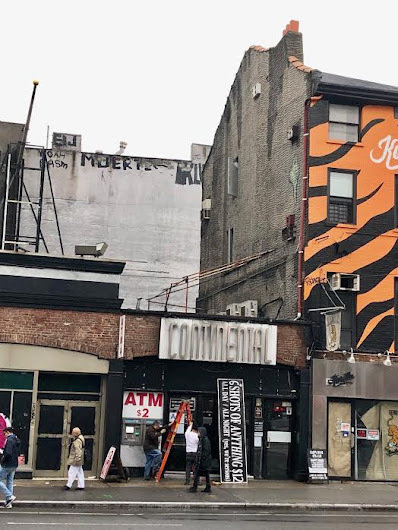 @anon 12/15/18 10:00 AM, given, yes, it hasn't been a neighborhood staple for a long time, but if you remember the 1990s and you went to see shows at the continental and coney island high and all those other places, you would have some regrets that these places are no more, just as you do about the other places that have come and gone. 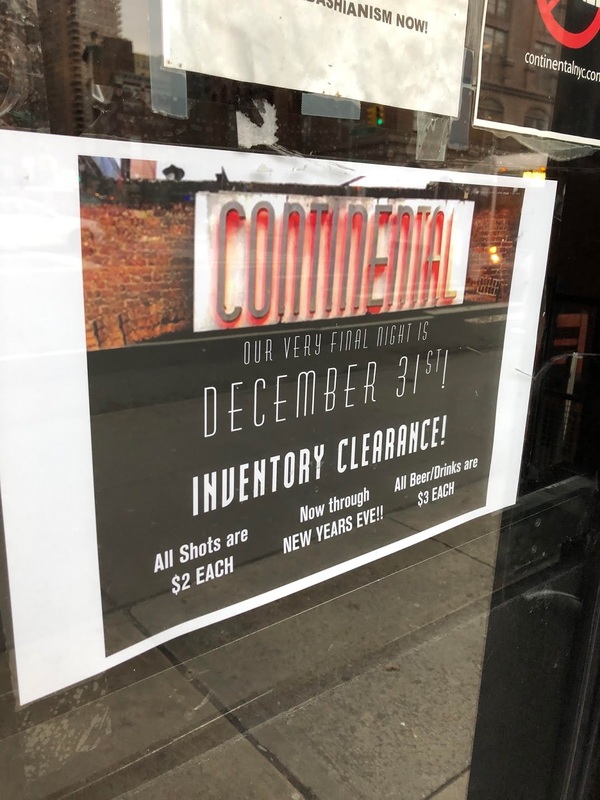 Most of us who enjoyed the continental back in the day probably did our grieving when they dropped live music and changed into the 6 shots place, but that doesn't mean we can't remember it fondly now, or that we should say good riddance. I'll always miss coming off of the train at astor place and seeing the continental and the mixtape guy and the gringo mural and knowing I was back on one of my favorite blocks. It's kind of funny to think of the EV resident of a certain vintage (think recent grad) who is seeing their go-to cheap shots spot close down and is saying to their friends, "well, there goes the neighborhood."